In 2009, I happened upon the Center for Civic Education’s Project Citizen and I knew that it was a program I had to bring to my 8th grade American History classroom. Over the last decade, Project Citizen has given my students the skills necessary to be politically active citizens, the experience of being involved in a project larger than themselves and their own academics, and the confidence to use their voices in knowing that they can be a part of the change they want to see in their world. 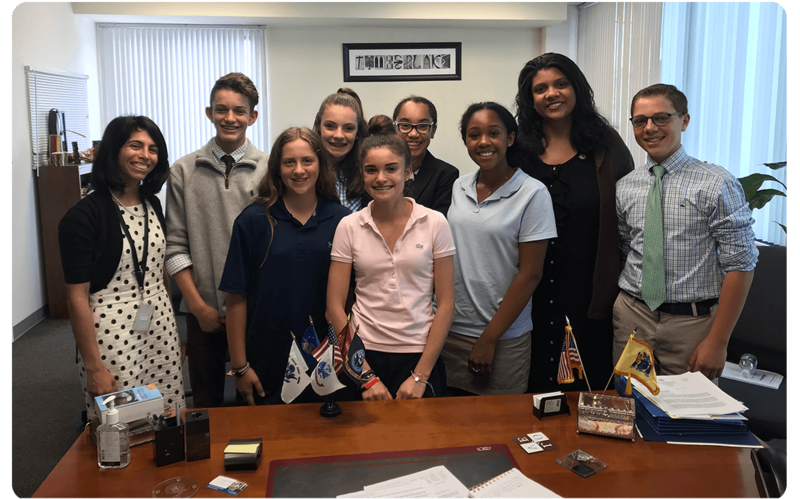 The 2017-2018 school year was a particularly exciting one for the 8th-grade students at Montclair Kimberley Academy in Montclair, New Jersey. In choosing hunger in our state as a policy issue, they opened a door into the government process they never expected and made a commitment to public policy that has reached beyond graduation. Students from Montclair Kimberly Academy with Assemblywoman Britnee N. Timberlake of New Jersey (second from right). Teacher CherylAnne Amendola, the 2017 New Jersey History Teacher of the Year, is at the far left. Amendola teaches Project Citizen to her eighth-graders. She writes, "Over the last decade, Project Citizen has given my students the skills necessary to be politically active citizens, the experience of being involved in a project larger than themselves and their own academics, and the confidence to use their voices in knowing that they can be a part of the change they want to see in their world." When we began Project Citizen as a class in April 2018, the students worked collaboratively to decide to focus on hunger. Their research brought them down several avenues, as they understand that hunger is a universal problem that is tackled at every level of government and by many non-government organizations. The inspiration for their particular policy solution, however, came from a seemingly unrelated act of the New Jersey Legislature. In 2016, the Legislature of the State of New Jersey proposed an act that would allow individuals to voluntarily contribute to the funding of a state World War II memorial through their gross income by checking a box off on their New Jersey state tax return. My students thought this idea was brilliant as they could use the same concept to allow New Jersey residents to voluntarily send greater funding to the New Jersey SNAP program. They wanted state residents to have the option to give $2 of their own income to SNAP by using a checkbox on their tax return. Once they felt their research was sufficient and their policy written as clearly as they could explain it, our students set off to work implementing the action plan that they had been writing. They called Senators and members of the New Jersey General Assembly. Through persistence and effort, they got through to the New Jersey Division of Taxation to find out how and when tax return forms are written. One of their most exciting moments was securing a meeting with New Jersey Assemblywoman Britnee Timberlake. Project Citizen was becoming more than a class project; it was now a quest to help others and a time for students to flex their political muscles. Students prepared for their meeting outside of class, they booked their own transportation, they researched the types of laws Assemblywoman Timberlake had been responsible for drafting in the past and they knew her voting record. They dressed in their most professional clothing for their meeting and spoke with confidence, clarity, and poise. My students, who thought this was “just another project” convinced our Assemblywoman to send their policy proposal to the Office of Legislative Management for drafting. They were beside themselves with pride, as they should have been. Graduation came in June, but the momentum these students began has not stopped. Assemblywoman Timberlake was up for reelection during the midterms and my former 8th-grade students watched nervously in hopes that she’d be reelected and did their part in telling any adult who would listen why it was important to them for Assemblywoman Timberlake to stay in office. They continue to collaborate on their project because they want to see the bill through as far as it will go. For instance, in August, Assemblywoman Timberlake’s office communicated that funding SNAP wouldn’t be possible, as it is funded completely by the federal government, therefore the state made no contributions. The fact that it was summer and that they had graduated 8th grade didn’t matter to these students. They communicated electronically to find out how New Jersey helps its hungry residents. They decided their checkbox should send funding to WorkfirstNJ, which is the program through which families in New Jersey can receive temporary cash assistance and social services from the state with the end goal of helping people secure employment and self-sufficiency through job training, work activities, and education. Project Citizen gave them a gift. These students know how important their voice is. They are beginning to understand the government and how it works. They have seen, with their own eyes and in their own experience, that they need to be the voice of those who don’t necessarily have a voice, and that they can do that simply by being active citizens in their democracy.